Military Equipment Carriers require special tools, licenses and a team with plenty of experience. Often military vehicles are large sized. So it is a thorough process to ship them. You need to be really sure about the car transport company you are going to ship with. Of course, not every auto shipping company can provide this kind of service. And choose from the ones that can still be very careful. Make sure you are going to ship with trustworthy auto movers. With this kind of vehicle shipping, you can’t let anything go wrong. For this, there is Boston Car Transport. Boston Car Transport is a full-service auto shipping company. Military Equipment Carriers are one of our specialized services. Our professional team knows how to deal with this kind of service. We have all the tools needed and the fleet right for this purpose. 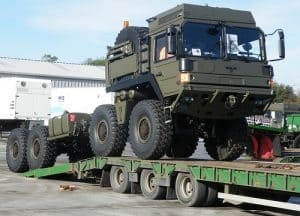 We create the safest routes for each Military Equipment Carriers orders. The drivers we work with are highly trained for heavy loading and unloading. We can ship to army and navy bases and know all the details of such type of Boston auto transport. Our company also has a special heavy haul service which can assist you with other over-sized vehicles. We are also always happy to help military members and their families. In a PCS season, we can assist you with moving your vehicle to your new place. We will also provide you with a special discount. At Boston Car Transport we are proud to serve you! You will love our Boston vehicle shipping prices. For the exceptional quality of Boston car shipping services that we provide, our rates are really affordable. You can also get a free quote from our website or request it by calling us. Ship with one of top rated Boston auto shipping companies. All in all, Boston Car Transport will be happy to assist you!